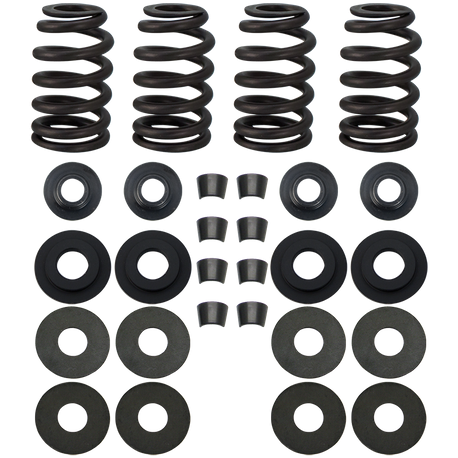 Street Performance .585" Valve Spring Kit for 1999-'04 Twin Cam 88® big twins w/ stock heads. Single wire conical shape. Suitable for high performance applications. Accommodates camshaft lift to 0.585”. Kit contains: Springs, Top & Bottom Collars, Keepers, Shims. Use with shoulderless-style valve guides. Special keepers included fit valves with stock 5⁄16" stems and S&S collars only. Spring seat force is typically 170 lbs. at stock 1.800" installed height. Open force is 390 lbs. at .560" lift, 415 lbs. at .630" lift. May also be used in any other heads that require stock O.D. outer spring. S&S springs will not fit 2005 - later stock heads because of the change in valve spring and valve stem diameter. High lift cams may require the engine builder to obtain additional clearance between the piston and valves, the intake and exhaust valves and the upper spring collar and rocker cover. Clearance should also be checked between the rocker arm and valve spring collar as well as between the rocker arm and rocker cover. It is imperative that the engine builder confirm these clearances and check for spring coil bind, even when using parts specifically designed for high performance. Most valve train failures can be traced to over-revving or failure to confirm correct clearances during assembly.